Alamo 13.1 | Best Lil Half In Texas! Half Marathon Race and Relay in San Antonio, TX - 5k and 10k Too! Blast off with the boom of an historic cannon start at The Alamo for this exciting 2nd Annual ALAMO 13.1. REGISTRATION FEES ARE NON-REFUNDABLE. YOU MAY TRANSFER OR DEFER FOR A FEE. PLEASE SEE OUR CANCELLATION POLICY SECTION ON THE GENERAL INFO PAGE. Delicious Baked Potato Bar with all the fixin’s, fresh fruit boat & more. Curious about running The Alamo 13.1 OR our ALAMO 26.2 Marathon but prefer 5 or 10k’s? 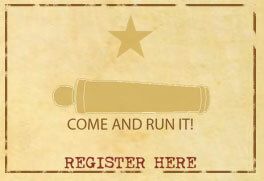 Experience the ALAMO 3.1 / 6.2 Krispy Kreme Doughnut Dash with all the grandeur & fun! Enjoy a fun 5K route or a very scenic 10k route along part of our historic Alamo 13.1 / 26.2 course. Run an original classic with the charm of a local run. Pulsate past cultural icons of San Antonio towards an epic finish. Dash for those Doughnuts at the Finish Line and get some great race swag. Come “FIGHT TO THE FINISH” and Register Today!! 2019 Alamo 6.2 Course/Alamo 3.1 Course Coming Soon!! Packet Pickup & EXPO – Venue Villita – 401 Villita St. Please DO NOT arrive before 11 and expect your packet. Doors open at 11. All our doughnut dasher’s will line up BEHIND the Half and Full Marathoners. You will have your own separate start once the Marathoners have passed the finish line area. CRIT celebrates the dignity of every individual serving children with neurological, muscular and skeletal disabilities and their families. CRIT is an integrated, state-of-the-art rehabilitation program that empowers patients to reach their full potential with inclusion to society. Find out more about them and the wonderful work they are doing by clicking their logo above. And if you feel so inspired, give them donation to help with their work!